As high-end smartphones continue to increase in size and functionality, some of the world’s leading vendors have begun investing their valuable R&D dollars in the research and development of newer and more innovative device form-factors — specifically, those that would allow for even larger and higher-quality touchscreen displays in even more portable form-factors. Samsung is probably the closest to releasing the world’s first truly foldable smartphone for the general market. And while it won’t come cheap, at an estimated $2,000, the Galaxy X is slated to offer a number of ground-breaking and first-of-its-kind features, including as many as three displays, but at least one foldable OLED panel measuring in at 7.3-inches. Even Apple has been dabbling in the foldable smartphone space, having previously received a number of foldable iPhone patents — with some analysts even predicting a foldable iPhone could launch by 2020 — through the patents alone would confirm the iPhone-maker is at the very least interested in the foldable smartphone concept. Now, for the very first time, we’re able to see for ourselves how a foldable smartphone functions, courtesy of a brief but compelling video uploaded to Twitter this week by user @bang_gogo_. The self-described Tech micro-blogger is known for covering leaks, news, and reviews for multiple international tech news outlets including GSM Arena, Gizmodo China and more. 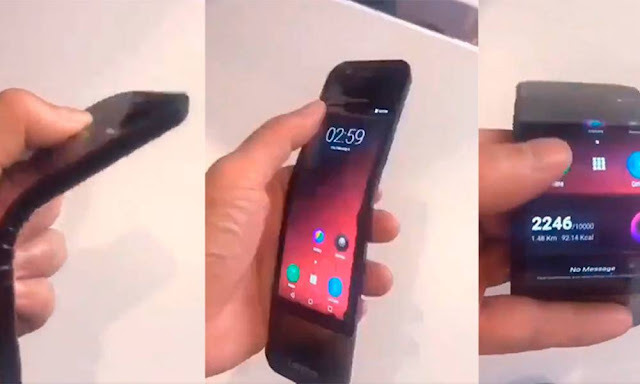 The video shows a prototype Lenovo smartphone which appears to be fully functional, at least for a prototype — the screen fully lights up and apps load, for example. As you can see, the handset is rather tall and narrow — but that’s primarily because, as you’ll also see, the whole thing can be folded in half like a digital, display-equipped soft taco. You absolutely have to see this thing in action to believe it! While the handset doesn’t allow for folding in half completely like a quesadilla, it’s chassis is built around a durable “hinge” mechanism, which we’ve seen documented and outlined in a number of previous patents, and essentially functions as a ‘pivot’ around which the bendable OLED display panel is able to fold outwards, as you can see in the video, as well as inwards. Unfortunately, there are a number of visible and not-so-visible abnormalities with this particular prototype, including that extremely large chin at the bottom of the handset, and what appears to be a small black spot on the right-hand side of the screen near the hinge, which may be an abnormality with the prototype rather than a systemic issue. Luckily, we’re still months (if not years) away from seeing these commercially available foldable devices hit the market. And while Samsung is poised to be first with its high-stakes and high-priced Galaxy X, it’s only reasonable to assume we’ll begin seeing a number of these devices from the likes of Lenovo, Huawei, Samsung and probably even Apple, eventually. In either case, the technology itself is still impressive, and we can only expect it will be even further improved and refined by the time a commercial product is available.